Advances in cardiac pacemakers over the years have made these devices safe, and effective and reliable. People who have pacemakers can usually lead entirely unrestricted lives. If you have a pacemaker or have been told you need one, this article should help you understand what a pacemaker does, and what you might expect from it. A pacemaker is a small but very sophisticated electronic device that is implanted under the skin to help regulate the heartbeat. Specifically, pacemakers are most commonly used to treat several cardiac arrhythmias that produce bradycardia—a heartbeat that is too slow. The heart rhythms that cause bradycardia are sick sinus syndrome and heart block. Pacemakers usually eliminate the symptoms caused by bradycardia including weakness, fatigue, lightheadedness, dizziness, or syncope (loss of consciousness). Read about the heart's electrical system. In some people who have heart failure, a specialized type of pacemaker can help coordinate the beating of the cardiac chambers—the atria and ventricles. These specialized pacemakers—which are called cardiac resynchronization therapy (CRT) devices—can significantly improve cardiac function and symptoms in many people with heart failure. Contrary to what you may have heard, pacemakers do not take over the work of the heart. After you have a pacemaker, your heart still does all its own work. Rather, the pacemaker merely helps to regulate the timing and sequence of your heartbeat. Pacemakers consist of two major parts: the generator and the leads. The generator is essentially a tiny computer (along with a battery and other electronic components), housed in a hermetically sealed titanium container. Most modern pacemaker generators are roughly the size of a 50-cent piece and approximately three times as thick. A lead is a flexible, insulated wire that carries electrical signals back and forth between the pacemaker generator and the heart. One end of the lead is attached to the generator, and the other end is inserted through a vein into the heart. Most pacemakers today use two leads; one is placed in the right atrium and the other in the right ventricle. 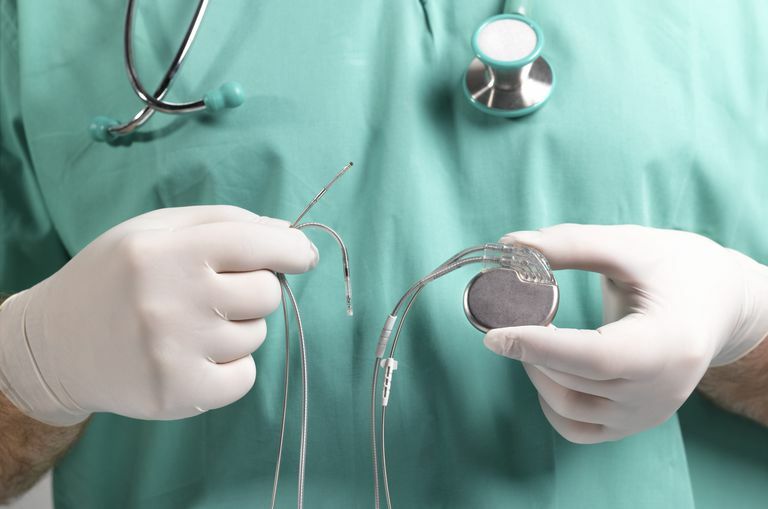 Pacemakers are implanted under local anesthesia. The generator is placed under the skin, beneath the collarbone. The leads are threaded through a nearby vein and advanced to the appropriate position within the heart, and their ends are plugged into the generator. The implantation procedure usually takes 30 minutes to an hour. Pacing can be done from the right atrium, the right ventricle, or both. The pacemaker decides on a beat-to-beat basis whether it needs to pace, and if so, in which chambers it should pace. This “intelligent pacing” makes sure that an appropriate heart rate is always maintained for the body’s immediate needs, and that the work of the cardiac chambers is always coordinated. Pacemakers are "programmable," which means that the specific functions they perform can be altered at any time. Programming a pacemaker is done by wirelessly transmitting new instructions to the generator, using a special device called a programmer. For instance, your doctor can easily reprogram your pacemaker to change the rates at which it will pace your heart. In the early days of pacing, pacemakers were only able to pace at one specific heart rate. Whenever the patient's own intrinsic heart rate dropped below that pre-set rate (say, 70 beats per minute), the pacemaker would begin to pace at that fixed rate. But today, almost all pacemakers have the ability to vary the rate at which they pace, depending on your immediate needs. These pacemakers are called rate-responsive pacemakers. Rate-responsive pacemakers can use one of several technologies to determine the optimal heart rate, but two, in particular, have proven quite useful. One of these is the activity sensor, which detects body movement. The more active you are, the faster the pacemaker will pace your heart (within a range of heart rates that is set by your doctor). The other method commonly used to vary the rate of pacing is a breathing sensor, which measures your rate of breathing. The faster you’re breathing, the more active you are (presumably), and faster the pacing will be (again, within a pre-set range). Either of these technologies allows rate-responsive pacemakers to mimic the normal, moment-to-moment changes in heart rate that would be provided by a normal heart rhythm. How Often Should Your Pacemaker Actually Pace Your Heart? In the majority of people with pacemakers, the heart's own electrical system is actually generating most of the heart beats. The pacemaker is there mainly as a "safety valve," to prevent occasional episodes of inappropriate bradycardia. In other people the pacemaker works mainly in the rate-responsive mode, to allow the heart rate to increase appropriately during exercise. While they are at rest, the pacemaker is usually not pacing. Rate-responsive pacing allows them to be much more active with much less fatigue. Still, other people have more severe forms of bradycardia and may require pacing virtually all the time. These people often will quickly develop severe symptoms if their pacemaker should ever stop functioning normally. So doctors refer to them as being "pacemaker-dependant." What Is Life Like With a Pacemaker? Pacemakers are supposed to prevent or eliminate problems, not create them. And generally, that is what they do. As long as you follow a few simple precautions, and follow your doctor's instructions for having your device checked periodically, you can plan on leading a life that is virtually free of restrictions caused by the pacemaker itself. You will need to have your pacemaker checked periodically, and when the battery finally begins to get low (usually after 7-10 years) the pacemaker generator will need to be replaced. (This is generally a simple outpatient procedure.) In most cases, people can completely forget they have a pacemaker at all other times. Here is a more extensive discussion about living with a pacemaker. Brignole M, Auricchio A, Baron-Esquivias G, et al. 2013 ESC Guidelines on Cardiac Pacing and Cardiac Resynchronization Therapy: the Task Force on Cardiac Pacing and Resynchronization Therapy of the European Society of Cardiology (ESC). Developed in Collaboration with the European Heart Rhythm Association (EHRA). Eur Heart J 2013; 34:2281. Tracy CM, Epstein AE, Darbar D, et al. 2012 ACCF/AHA/HRS Focused Update of the 2008 Guidelines for Device-based Therapy of Cardiac Rhythm Abnormalities: a Report of the American College of Cardiology Foundation/American Heart Association Task Force on Practice Guidelines and the Heart Rhythm Society. Circulation 2012; 126:1784.